How Can I Get More People to Subscribe to My Blog? So, you have a blog and are producing great content, but it may feel like that content isn’t getting viewed as much as you would like. And let’s face it, being in the B2B world, we don’t want people to just read our blogs, we want them to subscribe to them so that we can set up email marketing campaigns and turn these subscribers into engaged leads and sales. When it comes to a B2B brand’s blog, the top metric that most marketing departments looks at are number of subscribers to the blog aka new leads. So many marketers spend more time on promoting their content and getting subscribers than they spend on actually writing content. Because promoting content and getting subscribers is that important. Companies with blogs generate 55% more website visits than those without blogs. Over half of content marketers list blogs as being their number one content creation priority. 47% of buyers view 3-5 pieces of blog content before engaging with a sales rep. So now that it’s been established that blogging is uber important and that a blog can generate leads for your brand, let’s explore how you can get more people to subscribe to your blog. At the end of each post. 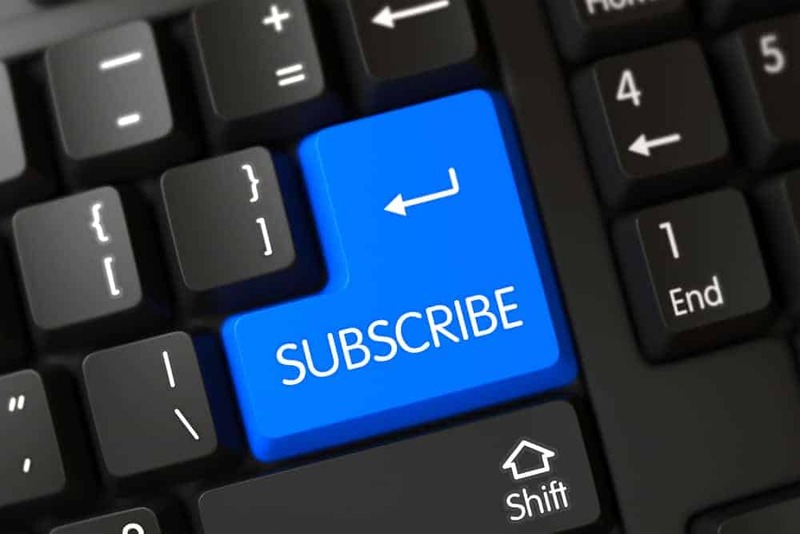 You can create a subscribe button in any WordPress theme or you can have your website designer create one really easily. Just make sure it’s hooked up to your marketing automation platform so that all of your blog subscribers are being funneled into a specific list. Aside from having a small CTA to subscribe to your blog on the sidebar of your homepage, try dedicating a section of your homepage to your blog. Talk about your blog’s theme and have a carousel of your latest posts for site visitors to check out. In addition to having a subscribe button in strategic places on your site, you can also create a separate landing page just for getting people to subscribe to your blog. You can tease readers with a summary of the strategies and information that your blog covers and offer a sample of your best blog posts. 70% of people who come to a website never come there again so it’s crucial to capture their information right away. Popups are hard to ignore and if the popup goes up while the reader is viewing one of your great blog posts, they might want to sign up so they get more great content like the piece they’re currently reading. An easy but overlooked way to get people to subscribe to your blog is to have a link to it in your email signature. Think of all the emails that you send out per day and all these people could be potential blog subscribers! This is another reason to have a subscribe landing page because it would be better to put the subscribe landing page in your email signature as opposed to a link to your blog. Bribe people who come to your homepage or blog with a free ebook or white paper when they subscribe to your blog. It’s completely ethical and just may help blog viewers take that extra step to subscribe to your blog. Virtually networking in groups like LinkedIn Groups and Triberr can you engage with like-minded professionals and you can invite them to read your blog posts and subscribe to your blog. Be sure to lead with your best content and ask them to share it with their own readers and ask them to subscribe to your blog. Play fair and subscribe to their blogs too! It’s likely that part of your content marketing strategy involves producing content that is gated with a lead capture form like ebooks, white papers and webinars. In your lead capture form, you can put a check box that allows people to subscribe to your blog in addition to downloading your piece of content or registering for your webinar. OptInMonster is a tool that helps marketers convert website visitors into subscribers. In it, you can design forms, show personalized messages according to behavior patterns, A/B test your ideas and it helps marketers create the type of forms we’ve talked about in this post like side bars, floating bars and scroll boxes. OpInMonster has gorgeous templates so it takes the design work out of the process on your part. Don’t over e-mail them. Instead, consider a weekly or monthly digest of your brand’s best content. You can automate this process with FeedOtter. Continue to put out great content that readers actually want in their inbox so be sure to consult your buyer personas and stay up to date on your industry so that you constantly producing great content that keeps your subscribers engaged. Optimize your content for SEO so that it continues to be found organically and attract new readers and hopefully subscribers. Keep implementing these strategies continuously so that you’re constantly attracting new subscribers to your blog, your work is never done! Do you have any strategies that have worked for you to grow subscribers to your blog? We’d love to hear about them on Twitter @Feed_Otter! https://i0.wp.com/www.feedotter.com/wp-content/uploads/2019/03/shutterstock_421834366.jpg 667 1000 Kristen Matthews https://www.feedotter.com/wp-content/uploads/2018/09/200w-feedotter_LOGO-negative.png Kristen Matthews2019-03-29 12:34:232019-03-29 16:31:14How Can I Get More People to Subscribe to My Blog?